The best kept secret is the local Moose population around our camps. We have gated access to 26,000 acres of private lands where very few people have had the opportunity to hunt. Over the past few years, several 50+ inch bulls have been spotted AFTER the end of the Moose hunting season. 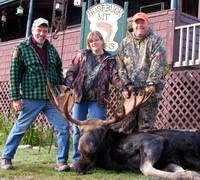 This year Bosebuck is offering a special Moose hunting package with our very own Registered Maine Guide.